One expects Western adventures to be set against magnificent scenery and driven by wilderness experiences. This mystery, based in Montana, definitely has a wilderness component, but the hero moves around so much that the sense of place gets diluted. 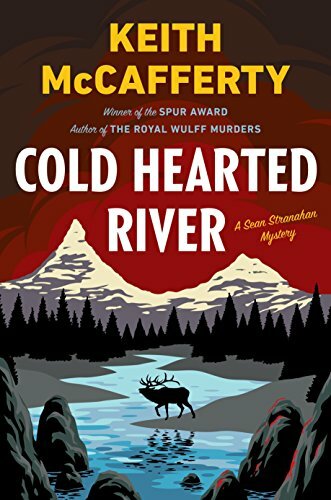 Cold Hearted River is the latest volume in the Sean Stranahan series. Stranahan is a private investigator when he isn’t being an artist and fly fisherman. Of these personas, the fly fisherman is the most developed and persuasive, and most germane to the story. The author relates what inspired the story in a preface about how he met Ernest Hemingway’s son, who told him about his famous father’s lost steamer trunk. Finding that trunk becomes a professional quest for Stranahan, with other characters several steps ahead of him or hot on his heels. The trunk’s contents are a goldmine for each pursuer for different reasons. Initially, the lost trunk is an apocryphal story. But then an item of its contents shows up, linked to a gruesome double death in the high country. Here the story’s sense of place is at its most detailed and profound, when two experienced residents go out unprepared and get caught in a spring blizzard that does them in. The story spins off from this event, tying the victims to killings related to the Hemingway goodies (which include legendary fishing tackle and an unpublished manuscript) and the black market for an aphrodisiac made from elk horn. The lead sleuths are Stranahan and his on-again/off-again lover, the testy sheriff Martha Ettinger. Stranahan often leaves her in the dark in order to pursue his inquiries on the shadier side of the law and/or involving other women. Those inquiries take him not only into Montana and Wyoming backcountry, but also across the country to an important fishing river in Michigan and out of the country to Cuba. Each stop follows a step on Hemingway’s life path and leads Stranahan closer to the treasure chest. Award-winning author Keith McCafferty shows his experience as a longtime writer/editor for Field & Stream through tight and expressive prose, ability to research a topic accurately, and broad knowledge of outdoor lore—especially fly fishing. Anglers will be able to relate to the details and environments he describes, and understand the temptation of Hemingway’s treasure chest. Non-anglers, meanwhile, will gain an understanding of fly fishing’s appeal, along with its procedures and enthusiasts. The mystery plot will intrigue anyone who enjoys whodunits and howdunits (particularly Hemingway fans); and those who like wilderness action will have their tastes fulfilled. Mostly, loyal readers of this series will get another juicy episode in Sean Stranahan’s unusual life. Hopefully the next volume will keep Sean on home turf, where the author can take us deeper into the country that draws us to his books.